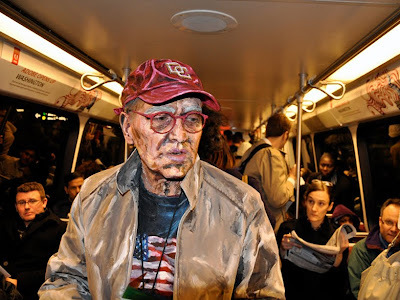 American artist Alexa Meade repackages & repurposes the common codes of painting by covering her subject and often its surroundings with layers of acrylic paint. Meade then photographs the subject which collapses the layered dimensions and poses more questions than it answers. She then adds a performative aspect by painting a small room with acrylic paint and posing her painted subject amongst the instillation for the duration of her art show. Try and wrap your skull around that! Happy Monday.